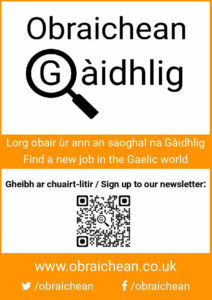 Tha sinn airson ‘s gu bheil fhios aig an urrad a bhu mhotha de dhaoine mu dheidhinn Obraichean Gàidhlig. 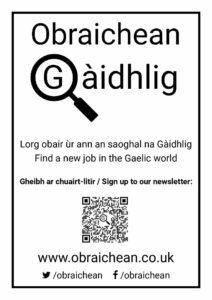 ‘S ann a bharrachd daoine a tha eòlach oirnn ‘s ann a bharrachd obraichean a bhios air an làrach agus a bharrachd cothroman a bhios ann cuideachd. 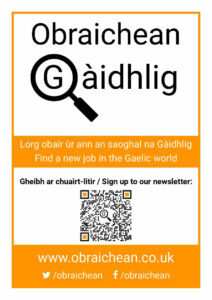 Mar sin, tha sinn air postairean ‘s bileagan a dhèanamh an seo airson a sgaoileadh. Ma ‘s urrainn dhuibh, priont copaidh neo dha a-mach ‘s cuir mun chuairt iad air neo cuir fios thugainn agus cuiridh sinn copaidhean thugaibh sa phost. 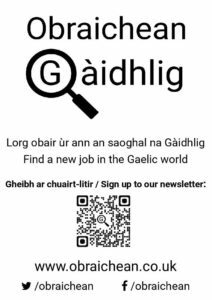 We want as many people as possible to be aware of us at Obraichean Gàidhlig; as the more people that are aware of us the more jobs will be posted on the site and the more opportunities will be available too. So we’ve created posters and leaflets for people to share. If you can, print out a copy or two and share them around or get in touch and we’ll send copies to you in the post.